Thanks to a generous $50,000 grant from the Cabela’s Outdoor Fund, the National Shooting Sports Foundation (NSSF) will provide its Project ChildSafe gun locks and firearm safety education materials to state departments of natural resources to promote secure storage of firearms to students in hunter education classes and other venues. 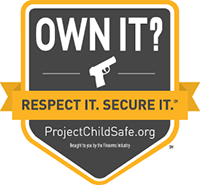 Project ChildSafe firearm safety kits include a gun lock and a firearms safety brochure that discusses safe handling and secure storage procedures, and how to keep guns from falling into the wrong hands. Shipments of the firearm safety kits will begin later this year, with the kits accompanied by supporting materials such as NSSF’s Safe Storage Options infographic, a firearm safety DVD, and NSSF’s new suicide prevention brochure. NSSF looks forward to working with state agencies again on this important firearm safety initiative designed to help prevent accidents, theft and misuse of firearms. For questions or more information about this program, contact Bill Brassard at bbrassard@nssf.org. Bass Pro Shops and Cabela’s Incorporated (NYSE:CAB), two iconic American outdoor companies with similar humble origins, and with a shared goal to better serve those who love the outdoors, today announced that they have entered into a definitive agreement under which Bass Pro Shops will acquire Cabela’s for $65.50 per share in cash, representing an aggregate transaction value of approximately $5.5 billion. 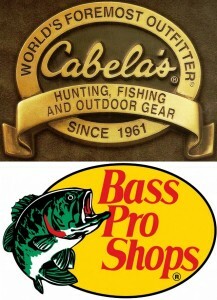 In addition, upon closing Bass Pro Shops will commence a multi-year partnership agreement with Capital One, National Association, a wholly-owned national banking subsidiary of Capital One Financial Corporation (NYSE: COF), under which Capital One will originate and service the Cabela’s CLUB, Cabela’s co-branded credit card, and Bass Pro Shops will maintain a seamless integration between the credit card program and the combined companies’ retail operations and deep customer relationships. All Cabela’s CLUB points and Bass Pro Shops Outdoor Rewards points will be unaffected by the transactions and customers can continue to use their credit cards as they were prior to the transaction. Capital One intends to continue to operate the Cabela’s CLUB servicing center in Lincoln, Nebraska. A driving force behind this agreement is the highly complementary business philosophies, product offerings, expertise and geographic footprints of the two businesses. The essence of both Bass Pro Shops and Cabela’s is a deep passion to serve outdoor enthusiasts and support conservation. The combination brings together three of the nation’s premier sporting brands: Cabela’s, a leader in hunting; Bass Pro Shops, a leader in fishing; and White River Marine Group, a worldwide leader in boating, which is part of Bass Pro Shops. Bass Pro Shops, Cabela’s and White River Marine Group represent the best of American entrepreneurship, innovation and devotion to customers. The combined companies will strive to provide a remarkably enhanced experience for customers, increased opportunities for team members and greater support for conservation activities.